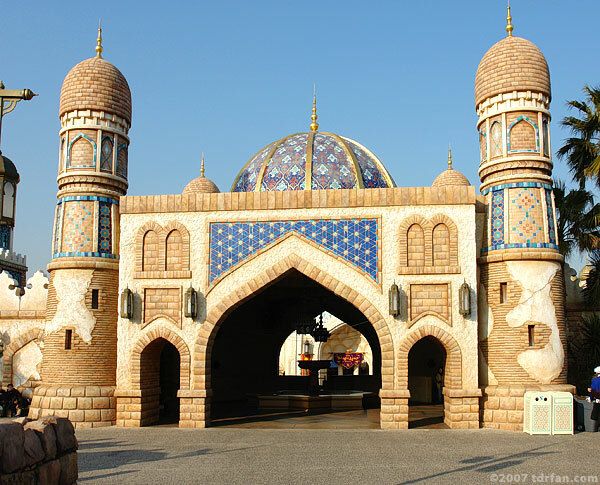 Although Arabian Coast is billed as a place that "recreates the exotic enchanted world from 1001 Arabian Nights," it could really be more accurately called "Aladdin Land," as Disney's animated feature "Aladdin" is an overwhelming influence in this area of DisneySea. Nearly all of the attractions, restaurants, and shops are tied in with that popular Disney movie. The real Arabian Coast is a place of history and opulence, and has been brought to life here with stunning detail. You can loose yourself in winding streets, or visit a large open-air plaza housing several of the area's attractions. One of DisneySea's riverways runs directly along the length of this area, enhancing the on-the-coast feeling. As I stated previously, the characters and influence from the Disney movie Aladdin are everywhere. One departure from this is the Sinbad's Seven Voyages attraction. Although it integrates beautifully and does not feel out of place, it was a curious choice for an attraction considering it does not have a Disney tie in. Still, it is one of my favorite attractions at DisneySea, and one I highly recommend.